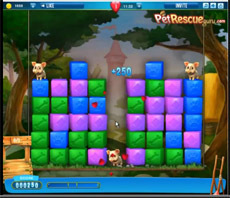 In Pet Rescue Saga Level 4 the target of rescuing the pets is introduced. Clear all the blocks below the animals in order to “drive” them to the bottom of the screen and save them. Watch our walkthrough video to complete the task, allthough it’s quite easy in this level.